At the end of August, I read an article about an ongoing debate on the ultimate bacon sarnie (sandwich) in The Register, a UK-based technology magazine. The author, Lester Haines, welcomed readers to email in their photos by Friday, September 14, so here it is. Bread: bread can be a contentious issue. Clearly, a proper English sarnie would be built upon slices of hand-sliced white bread. Well, we had just finished our loaf and chose a different avenue. Instead, we opted to get some Gryfe's bagels - one of the best bagels you can get that's not baked in Montreal. 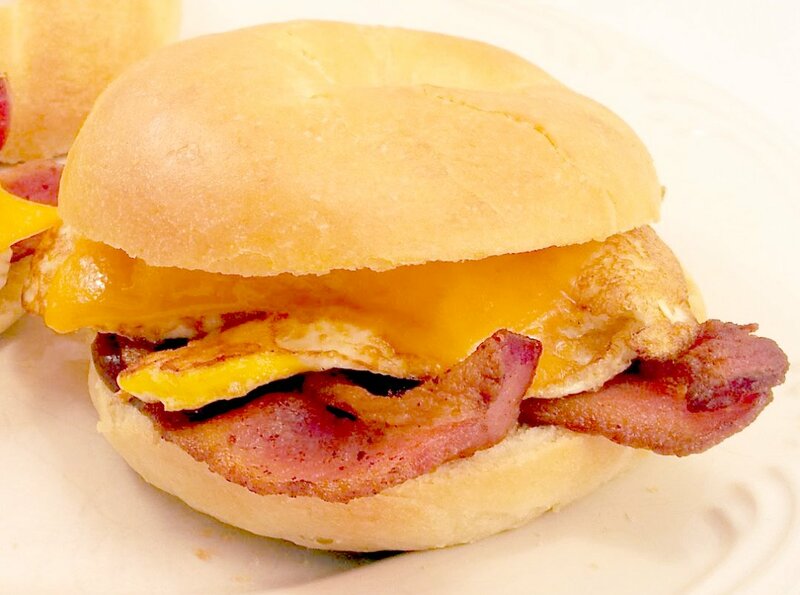 Bacon: our initial thoughts would be to Canadianize the sarnie a bit further by using pemeal bacon. That thought lasted until we realized that we already had some traditional slices in the freezer from a local butcher. Sauce: there was no debate here. It must be brown sauce, and it must be HP's brown sauce in particular. Eggs: yes, our sarnie has an egg. We hope it's not interpreted as an Aussie move, we just thought it would go really well with everything, and it sure did. Cheese: this is where things fell off the rails, sorta. We trotted off to the nearest grocer with high hopes to get some old Cheddar. We didn't want to buy the generic 1/2 kilo block of tasteless cheddar - we wanted something nice from the deli. There was only one problem: the Cheddar was made in Normandy. Say what? Yes, Normandy, France. We're hoping to be forgiven for that particular indiscretion. We're keeping the bagel, but we're hoping for proper English Cheddar for our next go. Verdict: this is the ultimate bacon sarnie. The bagel wasn't overpoweringly dense and allowed you to taste the rest of the sandwich. The brown sauce complimented both the bacon and the egg, and the cheese, despite surrendering as soon as it touched the egg, added just the right flavour. Slice bagels in half and butter both sides. Set the slices on plates. In a non-stick or cast-iron pan, fry the bacon and set aside. Wipe out the pan and and fry eggs, over easy. Before removing eggs from pan, place slices of cheese on top of the eggs and remove the pan from the heat. 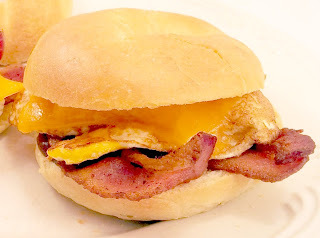 I have no traditional English bacon in the freezer but I could opt for my favourite peameal bacon. We can get it here in the wild, wild, west but the best I have found is from the St. Jacobs farmers market. Don't you love how some people call it "Canadian bacon?" When you say St. Jacob's farmers' market, do you mean St. Jacob's, Ontario? I love bagels, though not the white kind I'm afraid. And brown sauce is a real no-no for me! Def gonna try with the egg and cheese though added in, can't believe I've never tried that combo before. And I think that's exactly why the debate at The Register is so darn heated - there's no right answer. At least we're flexible and willing to try different versions. Is brown sauce a no-no for you on principle, or taste? The egg and cheese really rounds it out as a breakfast sandwich. I hope you like it when you try it. HP puts out a brown sauce (I like to use it on veggies). If you have a Whole Foods nearby, you can usually find it there in the British section. It's simply called "HP Brown Sauce."